GAA Child Protection and Foundation Coaching Course is organised for Saturday 12th May in Bawnboy, 9.30am -4.30pm approx. The Child Protection Course will cost €5 per person and certificate handed out on completion. On the day bring lunch and outdoor gear for practical session in afternoon. These courses are required for anyone interested in helping out at coaching or Cúl Camps and it is the last one of the year. If interested please email: secretary.shannongaels.cavan@gaa.ie as soon as possible or advise any committee member as names and contact numbers have to be submitted. 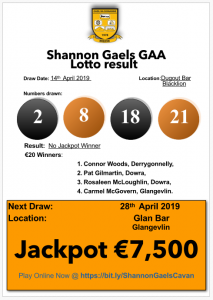 Club Lotto Result Update, Draw May 13th, 2018.